Equus Yoga is proud to work with your Collegial Competitive School Riding program or to your Professional or Amateur Riding Plan. The practice of Yoga and Mindfulness are one of the greatest tools to prepare the rider for competition and to be responsible for what they bring to their rides; in Mind and Body. Equus Yoga, a curriculum designed specifically for the Equestrians' needs, brings strength and flexibility to the proper muscle groups that support the Equestrian. Yoga has been proven to lower blood pressure, decreases anxiety, aid in digestion, which allows the energy in the body to move freely, therefore providing a cleaner line of communication to the Equine partner. The practice of yoga brings balance and harmony to the body. Having a bad day? Anxious? Irritated? Do you even know you are feeling these things? Are you achey, creaky, in pain? Does your back hurt? Do you have tight hips? Can you sustain and have the strengthen for a full event and support your horse in this? Before you mount up, be accountable to what energy you bring to your rides. Your horse feels everything that you are feeling. Pre-domestication, they survived by instinct and the intention of their predator. Your breath could mean life or death to them. They know before you are even near them what you are feeling. The horse is a direct reflection of your emotions and imbalances in your body. Is your horse always off to the left? Perhaps the imbalance lies within your body. If there is a weakness in your body your horse will feel it. This usually translates to the horse being 'off'. If you are weak in mind, your horse will find your edge and test you. Your horse needs you to be their calm, soft and powerful leader. Equus Yoga offers a practice in mindfulness, body mechanics and alignment through the practice of yoga and Buddhism. Both practices have greatly proven to benefit both horse and rider by bringing unity and clearer communication which directly effects performance. 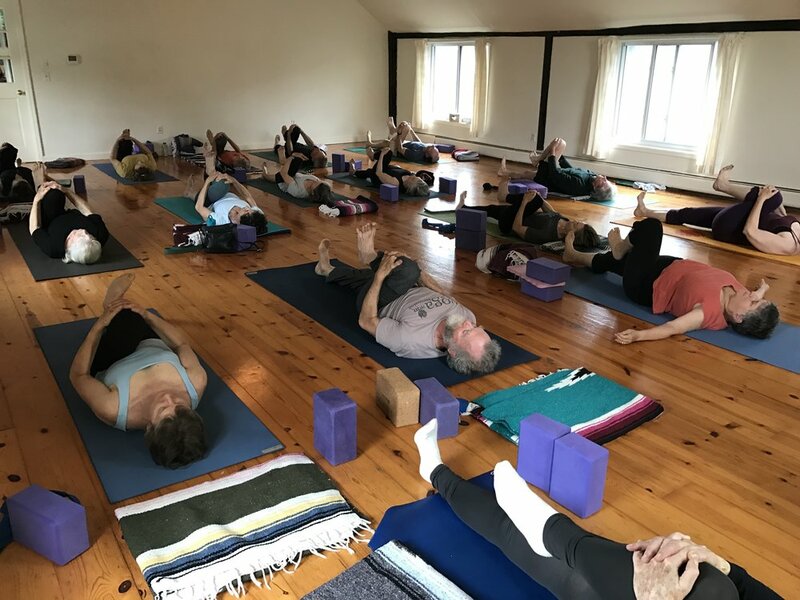 Monica’s class helped me connect with the energetic and subtle aspects of my yoga practice that instill connection, and awareness in my riding. I felt like I was given useful adjustments that I will carry forward into my practice. Because I ride many different horses, I appreciated her notion of “plugging in” to your mount through the lower half of your body, and taking a moment to hold space and empathetically experience the animal underneath you. Yoga for Teens! Help support the evolving teenage brain and body with Mindfulness, Body Awareness and a Beautiful Yoga Flow to support your Athlete or Worrier. 6 Week Series. This practice allows the rider to deepen their connection to their equine partner by practicing postures on Horseback. This is not acrobatics on horseback. This practice begins with a short warm up on the ground, to relax the rider and become accountable to the energy that they bring to their mount. Riders then mount and connect to their horse via breath and movement. Each posture and breath deepens the equine/rider connection. Meditation with movement and body awareness allows the partners to unify and deepens the performance level. Time is allotted to work one on one as well as group work. Our body holds the key to our thoughts, passions, and personal traumas. If you have thought it, the body holds it. A personal session to help you uncover and release old patterns, ways of being or perhaps and acceptance of what is. Allow your self to shine fully and be all that you were meant to be. 1 hour/15 mins sessions. Private studio. A guided hike with your equine companions, along fields and woods to a meditation sit spot. There participants will have a guided meditation, time for journal entries and free association writing, including but not limited to vision board work, intention and goal setting, personal work. Enjoy learning about new artistic techniques, inspired by the sights of the beautiful horses around you. Participants are led through a lesson, meditation with horses, journalling optional and then have time to create a piece of art work to take home. Allow this to be expressive, cathartic, for the amateur, professional or emerging artist in you, or someone who just enjoys both horses and creativity. Monica specializes in meeting the needs of her students. She specializes in bringing consciouness into the body and practice. Her depth of knowledge in the body through body mechanics, postural alignment; studies in multi disciplines including Shamanism, Energy healing, multiple certifications in Yoga for Immunity, and Physical Therapy bring depth to her tool basket as an educator. Whether it is through a Hatha based practice, a Vigorous Asana or somewhere in between; her teaching is Alignment based to meet the needs of her students. Whether it is a gentle class with modifications for students who have injuries or due to age related limitations, or a practice dedicated for the experienced Yogi. Monica can taylor a private practice for you, your wedding party, weekend guests, childs classroom, or just a 'tune up' class for you. Guided Meditations also available upon request. Class schedule on contact page. Allow Belle to be your mirror and to guide you to a place of relaxation and freedom to express yourself. Allow inhibitions to surface so that we may release them from holding you back, so that you may be the fullest expression of yourself. MINDFULNESS Workshop, for Handlers, Fear, What is your energy telling your horse? Allow the benefits of Mindfulness and Gentle Yoga to bring awareness to the Body and Mind so that we may be responsible for the Energy that we bring to working around and handling horses. Please see The MAT page for more information.